The effects of the new moon have continued for several days after the peak lunar influence has dissipated. Christian Zimmer and his buddy DJ Zeran showed for the their annual musky pillage trip before Christian heads back to Trent University to play volleyball (and study??) in September. Christian is a future star in the musky field. 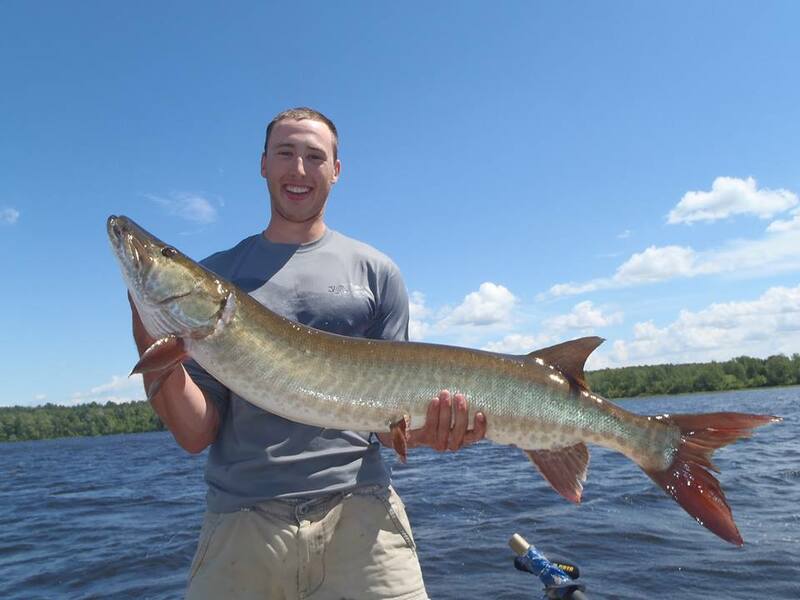 He is studying ichthyology and presently working on the Kawartha Pike Invasion Study with Muskies Canada founder Paul Gasparino on Balsam Lake. Kawartha Lakes muskies are ‘steroid’ muskies and although they are generally thin they are perhaps pound for pound the best fighting muskies anywhere. After you deal with skinny muskies for a while you need to handle a broad billed brute to get your perspective back to normal. The Ottawa River is the place to do it. Christian caught his first ever figure eight musky on this trip. I hope you saw the video in the previous post – it is awesome!. His buddy DJ landed his first ever musky as well and the boys scored a 5 spot including a 47 and a fat 46 1/2. The Ottawa River Musky Factory has left yet another young musky angler with a stupid musky grin on their face that will take weeks to remove only to be reformed every time he looks at the pictures. Oh ya – 4 out of 5 fish came on PDeez inlines. Figure it out yet? August and September are sold out. If you want in on the world class fall fatty fishing here on the Ottawa don’t wait too long to book your October or November trip.